German luxury car brand Audi on Monday staged the global launch of a new electric sport utility vehicle on the home turf of rival Tesla Inc, and highlighted a deal with Amazon.com Inc to make recharging its forthcoming e-tron models easier. 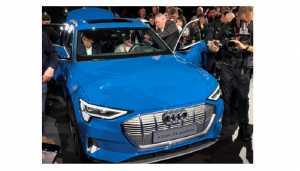 The e-tron is electric, and has two electric motors – one in the front and one in the rear, driving all four wheels. The Hungarian factory building motors for the e-tron will start with a production pace equivalent to 200 vehicles a day, Audi officials said.